In 1909 G. Aubrey Davidson proposed to the Chamber of Commerce that San Diego host a world’s fair to celebrate the opening of the Panama Canal. San Diego would be the first American port-of-call north of the Panama Canal on the Pacific coast. An exposition would call attention to this city of fewer than 40,000 people. It would be the smallest city ever to host such and event. San Francisco eventually was selected as the official “International” Exposition, but San Diego decided to hold its exposition anyway. 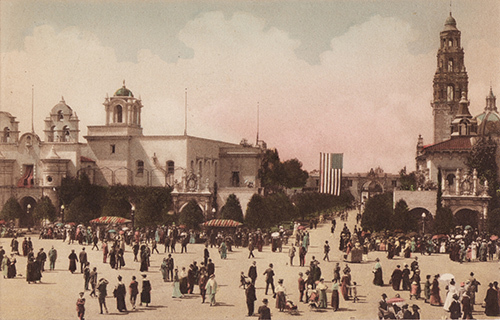 The Panama-California Exposition would be unlike other fairs—smaller, year-round, with an emphasis on gardens and an architectural style of its own. It would promote farming in the region, exhibits would demonstrate rather than display, and the story of man would be told by respected scholars. Spanish Colonial Revival Architecture was chosen as the design theme, for the first time in the history of U.S. expositions. Only a few of the Exposition buildings were intended to be permanent. Most were made of staff plaster, without foundations, and were meant to be demolished after the Exposition. But during the two years of the Exposition, San Diegans had fallen in love with what newspapers dubbed our “Dream City.” Threatened, saved, restored, and reconstructed over the years, Balboa Park’s National Historic Landmark District remains the country’s most intact example of exposition architecture and design in the United States. The 1915-1916 Exposition in San Diego’s Balboa Park was an important stimulus to San Diego’s long-term growth, bringing millions of tourists to a city that had a population of only 40,000 people when Exposition planning began. The year-long encampment of U.S. Marines on the Exposition grounds was popular with fair visitors and set the stage for a lasting military presence in San Diego, which in turn stimulated shipbuilding and defense industries. Bertram Grosvenor Goodhue’s Spanish Colonial Revival architecture influenced the course of public and residential architecture throughout California and beyond. The Exposition put San Diego on the map as a tourist destination with a year-round climate. City and County population nearly doubled between 1910 and 1920. The iconic California Building, home to San Diego’s Museum of Man, still displays art and artifacts that could be seen in that building during the Exposition. The Museum of Man, the San Diego Museum of Art, and the San Diego Zoo were direct outgrowths of the Panama-California Exposition. The restored Spreckels Organ Pavilion still hosts free outdoor concerts throughout the year. Balboa Park is treasured by locals and remains one of San Diego’s top tourist attractions.